North Korea is seeking to curry favour with South Korea, claiming common cause by seizing on the issue of forced labour under Japanese rule before and during the second world war, according to experts in Japan. In doing so, Pyongyang may also seek to mitigate its own conduct: specifically, the abduction of Japanese nationals by Pyongyang’s agents. Academics and human rights activists have accused North Korea of attempting to influence South Korean public opinion and government policy by portraying Japan which has been a long-standing security and economic ally of Seoul as a shared historical enemy. Japanese media have reported North Korean Foreign minister Ri Yong-ho told a Mongolian diplomat in mid-December to pass a message on to Taro Kono, his Japanese counterpart. The message was that Pyongyang would have “no choice” but to raise the matter of forced labour during Japan’s occupation of the Korean peninsula during any future diplomatic discussions should Tokyo demand information on the fate of Japanese nationals abducted in the 1970s and 1980s. The threat is that Pyongyang could follow Seoul’s lead and use legal measures to obtain compensation for its citizens or their descendants who were used as forced labour by Japanese companies. Pyongyang does not have the leverage of being able to seize Japanese firms’ assets in the North but any such legal rulings could further complicate Tokyo’s efforts to discover the fate of its missing citizens. The Japanese government lists eight men and nine women it believes were kidnapped by agents from the North in the 1970s and 1980s. Pyongyang admitted to abducting 13 of these people in an apology issued in 2002. Five were subsequently returned to Japan. Pyongyang claimed the rest had died or never set foot inside the country. Tokyo has refused to accept this explanation, as have the country’s human rights groups, which count the number of abductees at about 100. Japanese prime minister Shinzo Abe maintains the abduction are a major diplomatic issue. But if Japan attempts to pursue it in any future negotiations, the North is ready to hit back with the claim “more than 8.4 million Koreans who were forced to work” under Japanese colonial rule. That could in turn form the basis for a massive compensation claim against Japan. Pyongyang’s manoeuvring may have been encouraged by rulings by a number of courts in South Korea opening the door to former forced labourers and their descendants to sue the Japanese companies they worked for to obtain compensation. The Japanese government has criticised those rulings, insisting bilateral claims were settled by the 1965 agreement that normalised relations and has warned against any move to seize the assets of Japanese companies in South Korea as compensation. “We know there are secret negotiations taking place between Japan and North Korea at the moment and the abducted Japanese nationals are one of the biggest issues for Japan, so it is perhaps not a surprise that North Korea has linked the abductees with compensation [for forced labour],” said Yoichi Shimada, a professor of international relations at Fukui Prefectural University. “It’s a strong card that they can play in the negotiations, but more than that it allows them to portray themselves to a South Korean audience as being on the same side against Japan. 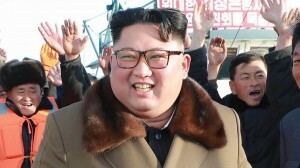 “Pyongyang will use anything that it can find to drive a wedge between South Korea and its old allies, primarily the US and Japan, in order to bring the South closer to the North,” he said, adding that Pyongyang has never reversed its position that the Kim regime is the sole legitimate ruler of the peninsula and that one day the two countries will be reunited under a government presided over by a leader from the North. Ken Kato, a Tokyo-based director of Human Rights in Asia, agreed Pyongyang is encouraging people in the South to demand redress for its own motives. “North Korea has for years been fabricating claims and accusations against other countries and they see this as a convenient way to hit out at Japan,” he said. Pyongyang’s triangulation coincides with a deepening diplomatic rift between Tokyo and Seoul. Abe’s government has indicated it is losing patience in the legal and political row over forced labour. Japan has asked South Korea to reply within 30 days to a request it filed for diplomatic discussions. The request was delivered on January 9 and South Korea replied it would review it “carefully”, although it is only now being reported a deadline was attached. Under the terms of the 1965 treaty, the two sides must set up an arbitration panel with a third party to discuss any differences of opinion. Given Seoul may choose not to ignore the deadline and that any diplomatic discussions will almost inevitably end in deadlock, Japan could pursue other recourse to settle the issue. One possible route could be via the International Court of Justice in The Hague for a decision on the scope of the 1965 agreement although Seoul might decide not to take part if it feared being on the losing side of a ruling.